Edward Norton stars in The Painted Veil as Walter, a husband and a doctor who brings his Kitty (Naomi Watts), his wife, to Shangai when he uncovers her secret romance with Charlie (Liev Shreiber). Edward Norton's previous work includes acting in such films as The Illusionist, Down in the Valley, The 25th Hour, Red Dragon, Fight Club, American History X, and Rounders. Ron Nyswaner wrote the screenplay to The Painted Veil. He has previously written the screenplay for such films as Philadelphia and Mrs.Soffel/ I had the privilege to interview both Edward Norton and Ronny Nyswaner together. 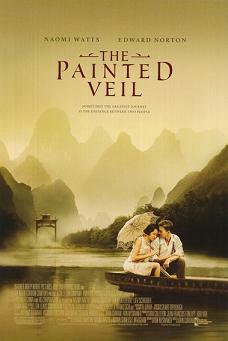 Warner Independent Pictures will release The Painted Veil on December 20th, 2006. NYC MOVIE GURU: Why did the music change since Jesus Camp played in the Tribeca Film Festival? NYC MOVIE GURU: Why did you decide to take on the role of Walter? EN: It was a combination of two things. If you watch David Lean films or Out of Africa, you can’t help but think how great it would be to have that kind of experience. When you see the potential in something for that kind of scope, it’s very tempting. The best of those movies, I think, are the ones that have themes at the heart of them that transcend the period. When I read [the novel] The Painted Veil, I found myself more moved by this story of these people, kind of, going through the process of losing their illusions about each other and managing to recover a deeper scene of each other. I related to it more than I tend to related to stories about wedding planners or things like that. So, for me, it was, sort of, the combination of the epic scope of the film, but with a set of themes at the heart of it that I thought were moving. NYC MOVIE GURU: What makes the role of Walter so challenging for you? EN: He has so many levels. On first impression, much as [Kitty] perceives him, the audience has a chance to perceive him as [being] a little bit antisocial [and] he’s very cerebral. As the story goes on, his unsuspected depths keep getting revealed—the depth of his passion, of his capacity to be hurt, in a way, [and] to be vengeful. He becomes almost violent [and] psychologically violent. That, too, gives way to a kind of humility and compassion that you don’t [notice] in him in the beginning. As an actor, you sit there going like, “Wow, this guy is quite an onion. He keeps peeling away and peeling away”. I think he hurt Kitty, equally. That’s what makes it a complicated little dance between the two of them. NYC MOVIE GURU: What’s it like working with Naomi Watts? EN: She’s supreme. I really can’t say enough good things about her. Beyond any film I’ve ever worked on, these performances were in lock step. There was no way to do one without the partner doing the other. They’re so intimately intertwined, it’s definitely the closest I’ve ever worked on a day-to-day level with another actor. It’s just fantastic because she’s so unafraid to work at levels of nuance. She’s putting together things so subtly. I love that [scene] in the film with her and Diana Rigg because she’s really not saying that much, but you feel the impact of this perception of Walter watching over her to the point when she walks out and can’t speak. That kind of work is so gorgeous. I think it’s the best of what you can do in film acting because it’s almost gestural. She’s got a great feeling of how much the camera can draw out of [her]. NYC MOVIE GURU: How long did you and Naomi Watts discuss The Painted Veil? EN: Naomi [Watts] and I talked for a couple of years. She was involved [with it], also, for a long time. A lot of times, we, sort of, wrote a lot about it. NYC MOVIE GURU: Did you write letters to eachother? EN: Yeah, not pretending to be the character or anything, but just kind of noodling on what we related to. Because the script was also developing, [we debated] how far we are going to take this moment, how overt is the forgiveness, [and] how much do you want them to say on his death bed—how much of it can be expressed in words and how much of it doesn’t need words. The both of us relied on John [Curran] enormously. She had a relationship with [him]—they had known each other for 15 years and already had done one film, [We Don’t Live Here Anymore], so that was great. We had to shoot this film profoundly out of sequence and do a lot of the deep scenes of [Walter and Kitty’s] relationship in the middle of the movie without having shot any of the beginning yet. That relies a lot on a director going, “Don’t worry about hitting it perfect. Let’s do pitch 1 here and [here] and give me the raw materials to sort it out later”. I think that requires an enormous amount of trust in a director because you feel that you have to be willing to, essentially, fail to do things that may be, like, clownishly wrong and you need a lot of trust among everybody. NYC MOVIE GURU: Were you familiar with W. Somerset Maugham’s other novels? EN: I had read a few of his [novels, but] I had not read The Painted Veil and I read Ron [Nyswaner’s] script before I had read the book and went back to the book and, in a way, then we moved on with the script. NYC MOVIE GURU: Ron, what changes did you make to the character of Walter? RN: When I started working with Edward, 6 or 7 years ago, [he] encouraged me to embrace a particular theme which is the grace that comes with forgiveness. In a book which has a narrative voice, which can explain what’s going on in some one’s head, perhaps you can take the luxury of having a character, sort of, remain very very bitter to the end. [In the book], you can rise about that bitterness and have that experience, but in the movie, you have to embrace one thing or the other. I think we moved away from Walter’s bitterness so that we could make a movie that’s, ultimately, very hopeful and about transformation. NYC MOVIE GURU: Edward, what's your response to that? EN: In some ways, I think that the Walter in the book is more harsh. In the book, many of the same things that happen [also] happen in the film, but they happen in different ways. In the book, [Kitty] has to go back to Charlie after his death and sleep with him again before she realizes how thoroughly awful he is. In the movie, we moved that recognition further forward. In the book, the impact of the experience with Walter and everything finally lands when [Kitty] goes home and asks for forgiveness from her father. In the film, we made that happen between her and Walter before his death. We never wanted to abandon the basic idea of a woman confronting the limitations of her view of life, but we wanted to let those changes take place between the two characters. NYC MOVIE GURU: What was it like filming in China? EN: It was a great experience. When you make movies, a lot of times, the artifice of the experience is very present all around you, so you’ll be creating a reality, but then, when you step out of work, it’s not that often that the experience of making a movie has a lot of parallels in the story. It was [paralleled because], in this case, we were working far from, we were working through the difficulty of translation. Sometimes [there’s] inefficiency communicating that way—people [do] things differently than when you do them. Your problems fade away because often this other context fed very directly into what the story was about and that was, kind of, special. There are frustrations to making anything way out there in places where there aren’t even paved roads, but those logistical challenges were minor compared to how great the Chinese crews [were]. Their work ethic was just unbelievable. NYC MOVIE GURU: What attracts you to Chinese culture? EN: I didn’t go looking for a film about China. The fact that I had some background in [its culture] just made it more appealing once I had encountered it. At the moment, it happens to be the [largest] country on Earth [and] it’s one of the most oldest cultures. In a lot of ways, China to me is like America in the sense that it’s too vast to encompass [it] easily or [to] make general statements about it. It’s geographically diverse [and], just like America, it’s ethnically diverse. It’s a place that’s [going through] enormous changes that are happening and that are palpable. In that moment that this story takes place, it was another moment in which change was ripping across that country and people were asserting their right to throw off the shackles of other countries meddling their affairs. NYC MOVIE GURU: Does the location of the film really matter? EN: It could take place in another similarly historic moment in another place, but, in this case, it’s not really part of the book, but [director] John Curran brought a specificity to the historical moment in the film. He pushed me and Ron [Nyswaner] to get more specific about when this was taking place and what was going on. We all recognized that that was smart because it resonated with things that we’re seeing today. John Curran is a good dramatist. He looked at this and said, “How can I create an environment around these characters that drives them closer together? Beyond cholera, what can be going on?” He found this moment in Chinese history when foreigners were being attacked all over the countryside and it’s just good drama. NYC MOVIE GURU: What were the effects of giving more attention to the Chinese perspectives? EN: The more we gave voice to the Chinese perspective on people’s interventions and their affairs, the more the Chinese people we worked with felt even more deeply connected to it. It was fairly late in the process when we wrote that scene where Walter is saying to the colonel at the campfire, “I don’t get your beef with me,” and the colonel says, “I understand that, but your country is pointing guns at our country”. The more we gave voice to the Chinese perspective, the more it gave it resonance, even for our Chinese colleagues.